View More In Traditional Folk. 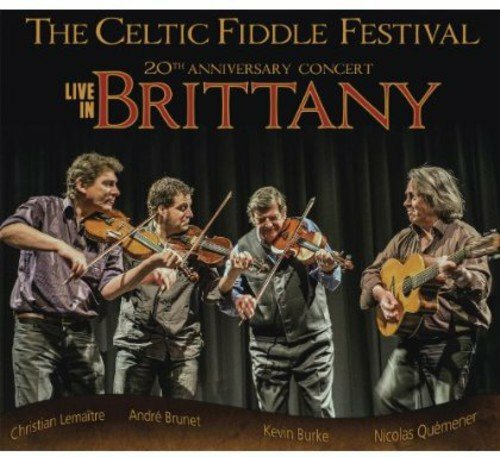 Live in Brittany is the celebration of 20 years of The Celtic Fiddle Festival. This new CD, the group's 6th, was recorded in January 2013 in the beautiful, centuries old, Breton town of Guémené-sur-Scorff. Featuring all newly recorded selections, Live in Brittany represents the rich cultural traditions of Ireland, Quebec and Brittany with performances that include newly composed pieces as well as tunes whose origin is beyond living memory. This CD encapsulates both the energy and excitement that can be generated in a live performance and also the magic and romance of this ageless music. The three visiting fiddlers, (Kevin Burke from Portland, Oregon, André Brunet from Quebec and Christian Lemaître from the nearby coastal town of Morlaix) and accompanist Nicolas Quémener, received a rousing and affectionate welcome from the enthusiastic audience at this memorable event. Enjoy the intimate warmth of a winter's evening concert in rural Brittany as you listen to these joyous performances . If you have any questions about this product by Loftus Music, contact us by completing and submitting the form below. If you are looking for a specif part number, please include it with your message.